Dynamics Telephony checks for a new queue-item after every call and then every 30 seconds. Here are reasons why this will not happen. NOTE: Your phone system may put you in “Red” after a call. Disable this if you can. You are put into “Pause” state if you have not selected an outcome by the end of “Wrap” time. To get out of “Pause”, click the “Play” button. You may have to select and outcome and also wait until the end of Wrap time (or “Skip” the Wrap time. If you turn your queue ON/OFF, then be sure it is ON. Click where it says ON/OFF to change. If this is a shared queue, then other users will take about a minute to change too. Dynamics Telephony contains a very convenient Phonebook panel, complete with Call History. All your internal and external contacts can be listed here. Simply start typing the name in the Search Box and the list is instantly filtered to match. Click on a contact to call them. If you have a call in progress already, clicking on a contact will Transfer the call to them. Quick and easy. Or enter a number in the Dial Box for contacts not in your phonebook. See here for how to set up your phonebook, for individual users or teams. The Phonebook panel also contains your Call History for the last 7 days (or to the limit of records set by your system administrator). Here you can see you recent Missed Calls, as well as your recent inbound and outbound calls. This is where you want to transfer a phone call to a co-worker blindly – without speaking with your co-worker first. This is where you wish to speak with you co-worker before transferring the customer to him. With a call in progress, make a call on another Call Tab. The first call is automatically out on hold. When the second party answers, consult with them as required. With a call in progress, make a call on another Call Tab. The first call is automatically put on hold. When the second part answers, hold down CTRL and drag the second call tab on to the first call tab. You are now in conference. Same as Conference Call except you can drop out of the conference and leave the other two parties talking, by clicking the red Release button. When Dynamics Telephony is used with DTI and a Contact Center, you can handle the Contact Center Outbound calls. 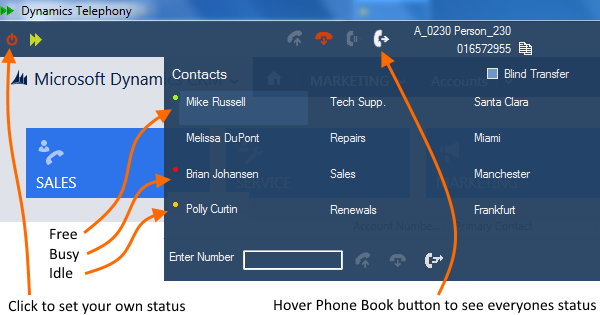 You can accept or reject an outbound call, and you will get a screen pop in CRM of the associated lead/contact/phonecall. First, use the agent status control (top right) to login and make yourself READY. To get more information before you “Accept” the outbound call, you can click on the customer reference (account, contact or lead), or the “Regarding”. Click Accept or Reject. If you reject the call, notice that you are automatically put in NOT READY. If you click Accept, the preview timer countdown (top right) may start. After the countdown completes, the phone call is automatically placed to the customer. Dynamics Telephony allows you to set a callback promise for a customer. 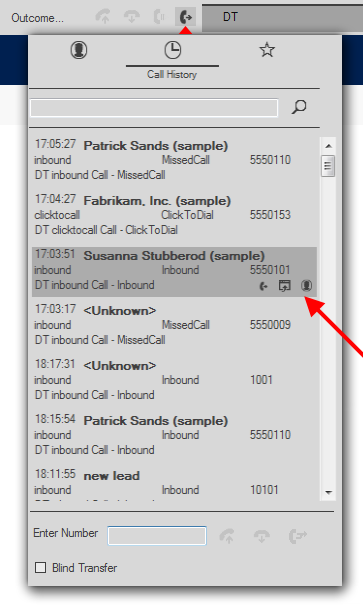 Select the Outcome “callback” in the Dynamics Telephony toolbar. 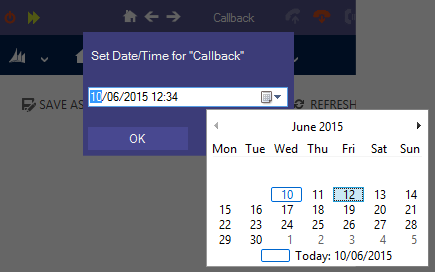 In the popup, select the date and time for the callback using keyboard entry, up-down arrow or the popout calendar. The callback promise will be entered as the “Due” time and date for the phonecall activity in CRM. In addition, if you have Dynamics Telephony Integration (DTI) with your contact center, the callback will be automatically presented to an agent at the appropriate time and date. 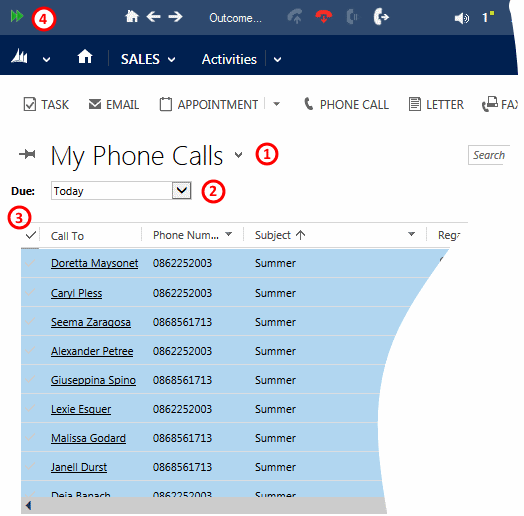 If you have Outlook integration for CRM, the callback may be managed there too. In Dynamics Telephony you can save all your frequently used contacts in your Phone Book. Then you can one-click call, or transfer to, these contacts. Also, the contacts in the Phone Book can be monitored for Presence – see here for more details. If you want, you can easily use the same Phone Book for all users. This way, when you edit the Phone Book (see below), all users automatically get the updated Phone Book. You could set up one Phone Book for all users, or one for each group. Restart the Dynamics Telephony client. <id>12</id> This is not required. If it is in your phonebook you should remove it must be unique for each contact, if you have it. <name>John Russell</name> This is the text displayed for the contact. <uri>6135551212</uri> This is the phone number or SIP address of the contact. Use SIP address if you want presence information. <presence>false</presence> This is not required and you can remove it. Specifies if Dynamics Telephony should try and get Presence information for this contact. Set to False unless you know you can get Presence for this contact. You can monitor the presence (or status) of the people entered in your Phone Book (assuming they “publish their presence”). Presence is published by SIP users, and some other systems too. In Dynamics Telephony settings, under Provider Configuration, tick the checkbox next to Publish Enabled. 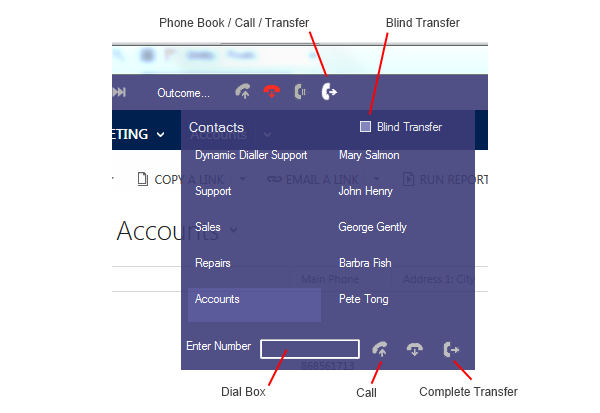 In Dynamics Telephony menu, select Phone Book. Edit the users you want to monitor similar to as shown below and save. In particular see the items in bold. See here for important details on editing the Phone Book. 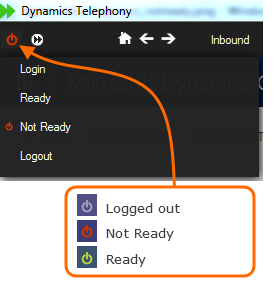 Restart Dynamics Telephony client. Hover over the Phone Book icon as shown in the screen snap above. 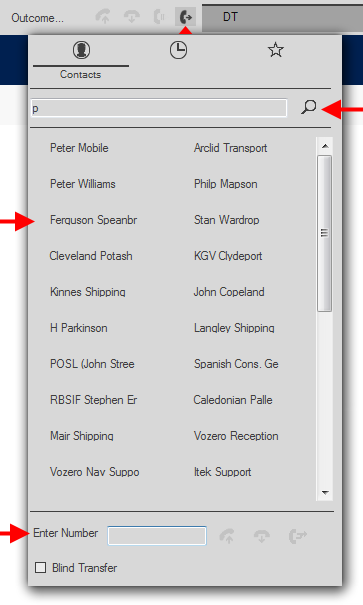 NOTE: You can also set your own status using the button on the extreme left of the Dynamics Telephony toolbar. Ability to easily switch telephony connectors. E.g. use Lync at home and Avaya in the office. Open different CRM instances in different tabs. Inbound call selects CRM depending on number called. Color coded tab and logo per CRM for easy identification. Agent login, logout, ready and not ready with reason, idle, busy, do not disturb etc. Informs agent about the product/service the caller wants. Optional Outcome selector to record result of call or trigger a callback or workflow. Advanced algorithm allowing correct dialing regardless of phone number format. Auto re-present rescheduled phone calls. E.g. No Answers come back after 3 hours (Configurable). Rescheduled calls can be for the team or back to same agent. Configurable max attempts for each outcome. All the features mentioned in previous section “Progressive Dialer” above plus..
A priority for each queue being worked. Time breakdown for every user, campaign, phone call etc. To, from, regarding, Start, talk, release, outcome etc. Configure text, reschedule behaviour, close phone call activity or not, etc. Anywhere you have a set of phone calls, you can add them to the Progressive Dialer to make calling them 50% more efficient. Once loaded, the Progressive Dialer will start immediately to dial the first phone call with a screen pop of it. See here for the Dialer controls and here for the Dialer settings.